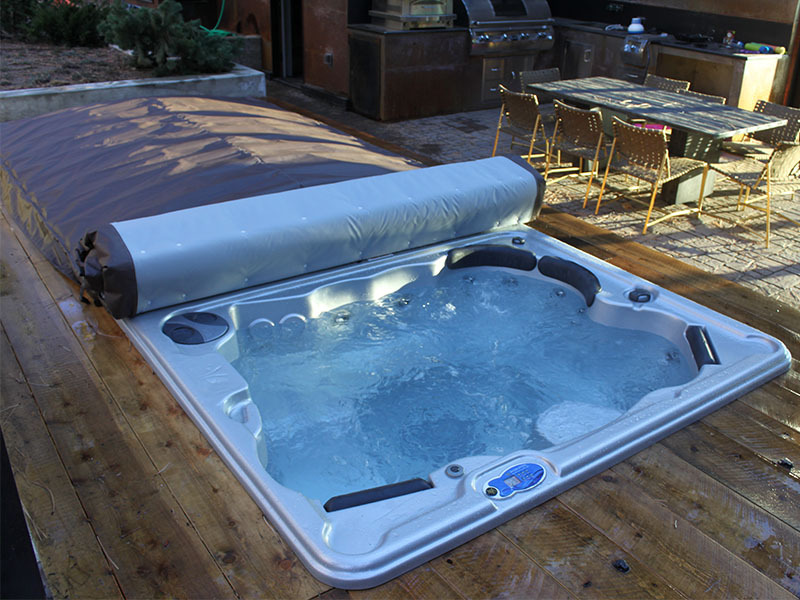 E2E Swim Spa Covers | Hot Tubs in Maryland, D.C. and Virginia from Hot Tubs, Inc. Introducing the E2E Cover™ by End 2 End swim spa covers. E2E has revolutionized the swim spa industry by correcting the number one problem for swim spa ownership. Old-style bi-fold covers absorb water and gain weight; they break down in the elements due to rain, snow, or direct sun, allowing heat to escape through their sections and seams. The E2E Cover one-piece design creates a complete seal all the way around the swim spa or in-ground pool, locking in the heat, lowering energy consumption and cost. The E2E Cover is user-friendly and designed for a single family member to access the swim spa easily, on a daily basis. With the use of closed-cell foam insulation, the E2E Cover will not absorb water, but remains light and efficient, providing more time for aqua therapy and fitness. The End 2 End Swim Spa Cover is built to last in all elements and weather conditions; it is fully framed to handle snow load. The top and thread are UV protected and will not deteriorate in direct sunlight. Our covers are manufactured with the highest quality commercial grade materials, providing a strong, durable, lockable safety cover. The E 2 E Cover is designed to roll in either direction, which is perfect for dual temperature swim spas by rolling back the pool side for daily swimming or the spa side for nightly relaxation. End 2 End Swim Spa Covers is all about the customer. They believe in the benefits of aqua therapy and fitness and they proudly manufacture for your family a custom cover, built for your home application and individual needs. Provides three major benefits: one-person accessibility, energy efficiency, and longevity. E2E Cover is the best swim spa cover you will ever own!